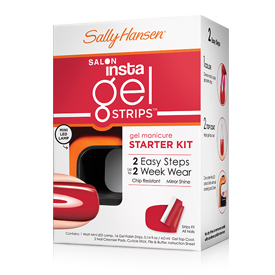 Here's a chance for one of you to win a Sally Hansen Salon Insta Gel Strips Starter Kit in Red My Lips! Its a great way to give yourself a super fast gel manicure at home without the long drying times. Red My Lips is a dark, glossy red with a creme finish! Read more on the kit here on the Sally Hansen website. Giveaway is US only and open until Feb 24th, 2013 11:59 p.m PST. I will pick one random winner on the 25th and contact you to get your mailing address! Winner will have 48 hours to respond, failing which I will pick another winner. Leave a comment below on this post mentioning your favorite red nail polish and how you follow my blog! All comments are moderated and may not show up immediately. I'll approve them as soon as possible. To enter, you'll have to be a subscriber through Google Friend Connect (or) Facebook(or) Twitter! You can do all or just one! Each one counts for an entry. Thanks for this rad giveaway!! My favorite red polish is America from Zoya. I follow you through GFC and Twitter. I adore 'Fishnet Stockings' by Essie. Thank you so much! I love California Raspberry by OPI. lebl9077@bellsouth.net I follow via GFC! Great contest! Following Amy Vienna through GFC. Followed with GFC (Allie Gunter), Twitter (@alliegee319) and Facebook (https://www.facebook.com/lunavida23). Julep Scarlett is my current fave! Following on google friend connect (amandaleaou) & my favorite red is from Zoya!!! My favorite is a custom blend I bought online a while back, chunky red glitter. Love it, reminds me of Dorthy from the Wizard of Oz's shoes. Too cute! My favorite red nail polish would have to be a Revlon I recently bought, I think it's called Raven Red. My favorite red nail polish is from Essie, called recessionista, it is a perfect plum red color! I haven't tried many red polishes so I don't have a favorite. I follow via GFC as Iliana R and my favorite red is called Fire from Josie nail polishes!